How can I monitor my VPS? You can configure a TCP monitor in the control panel for each of your VPS' IP addresses. The selected ports of your VPS are then automatically monitored by our systems. Should one or more of your selected ports become unreachable, you'll then automatically receive a notification per email and/or SMS. Hours during which the monitor is not active. In case your server will go down and then up again, you will receive a total of two messages. If your VPS is reachable then of course you will not receive any notifications. The monitoring service is free for all BladeVPS packages starting from the X4 and up. If you choose to receive SMS messages for your monitoring service, then you will be charged € 0,25 ex VAT (€0,3025 inc VAT) per message. You can also add monitoring to your BladeVPS X1 for € 9,99 ex VAT (€12,10 inc VAT). It is cheaper though to just upgrade your VPS to the X4 package. Log in to your control panel, navigate to the 'BladeVPS' tab and click the name of your VPS. Scroll down on the right hand side to 'TCP Monitoring' and click the cogwheel. The configured ports will be tested at an interval of your choice. The interval can be set from 1 to 6 minutes. Additionally, you can configure after how many timeouts you receive a notification, who the contact person will be, and disable the monitoring between specific times. The packages used to test your VPS' connection, have a low priority for your server and are easily dropped. As such we recommend choosing 4 or 5 timeouts, to decrease the chances of false positives. Additionally, your firewall may prevent the monitoring from succesfully testing the ports. 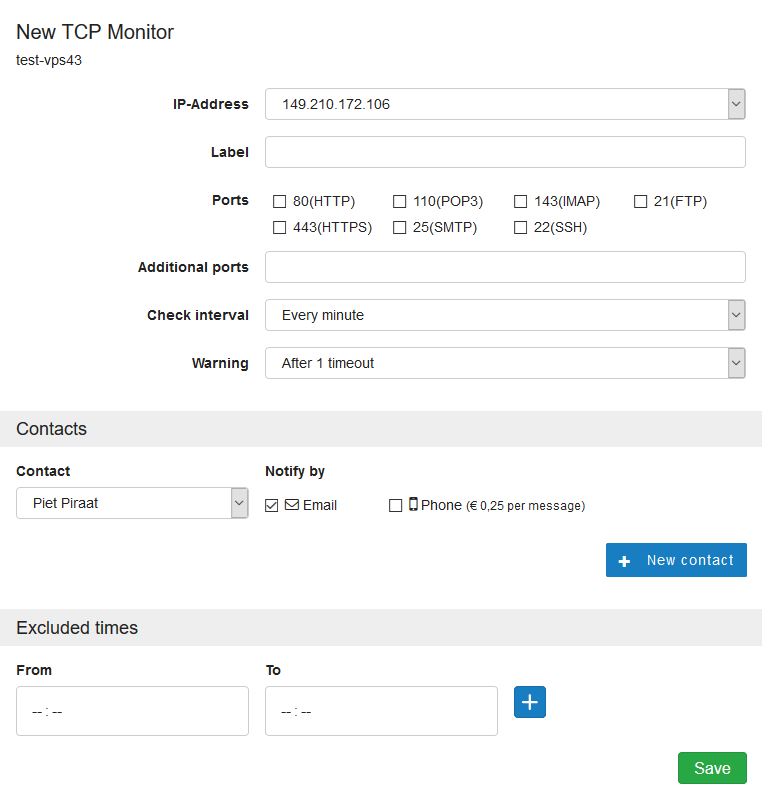 The TCP-connections to your servers are made from sms-monitor.transip.eu (95.170.78.114). You should grant this IP address access in your firewall settings if you want to monitor services that are behind a firewall.